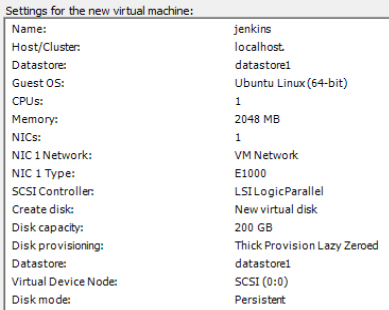 under my installation of ESXi and their set-up. The versions indicated are what this virtual machine started out with. If you do this, you'll have to install special JARs to extend the limited ones that come standard in compliance with U.S. export restrictions on cryptographic content software. The OpenJDK installed by Ubuntu does not observe such restrictions. I suggest https://help.ubuntu.com/10.04/serverguide/tomcat.html no matter what version Ubuntu you're running. Here is a scrape from another box I installed. After this operation, 414kB of additional disk space will be used. Selecting previously deselected package tomcat6. Selecting previously deselected package authbind. Not creating home directory `/usr/share/tomcat6'. Afterwards, I launched a browser and typed http://keltia.site:8080 and saw Tomcat's default, "It works !" message. This isn't really Jenkins at all. 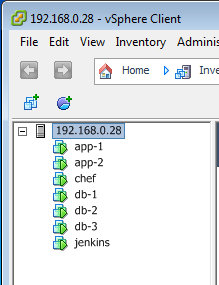 It's a garden-variety user named jenkins for the purpose of copying (deploying) WARs to this application server. It could be any user, even my own, but then I'd be tying my user down to a corner case on my application host and I don't wish to do that. See Solution for multiple deployments by Jenkins. In order to set up an RSA public key, I make this jenkins user a more canonical one. To do this, because of the lame way I created this user in the first place, I have fix /etc/passwd to make it use bash (instead of the Bourne shell). And I have to create the .ssh subdirectory. 0 upgraded, 1 newly installed, 0 to remove and 80 not upgraded. Selecting previously unselected package mongodb-10gen. To set up a MongoDB replica set (we're not setting up sharding), there's only one file to modify on each node. # These values are added here in configuration of a replica set. # No other values in this file were changed. * The port number is distinct on each node, 37017, 37018, etc. This node will erect a single shard, with no shard key, that an application will contact in place of establishing its connection to the replica via a list of replica nodes. It also obviates the need to know the entire list and provide for it in /etc/hosts. Instead, the application connects to this database node's hostname and port number. In turn, this node is connected to the three replica nodes (VMs) described in the previous section. This proceeds identically as for the previous MongoDB installation. To set up a MongoDB configuration server, we'll put MongoDB configuration in a different place from the usual /etc/mongodb.conf. Instead, it will be located at /data/mongodb/configsvr.conf. To set up a MongoDB sharding router, we'll put MongoDB configuration, again, in a different place from /etc/mongodb.conf, on the path /data/mongodb/sharding.conf. A JDK must be present given that Jenkins performs builds. update-alternatives: using /usr/lib/jvm/java-6-openjdk-amd64/bin/xjc to provide /usr/bin/xjc (xjc) in auto mode. ant must be installed and it must be at least version 1.8.1. It turns out that Ubuntu doesn't think ant's very stable. The Eclipse team does. Here's how it's said you can best get it installed. What's going on here? The command to get special packages from other repositories (without specially adding those to /etc/apt/sources.list.d), i.e. : add-apt-repository, is a feature of Python software. That must be installed first. Even with this, there were disturbing respository update errors, but it did work. PPA for the Eclipse package being developed by Debian. Need to get 3,945 kB of archives. After this operation, 5,134 kB of additional disk space will be used. Because Jenkins is going to use Git, I must install it. Need to get 6,741 kB of archives. After this operation, 15.2 MB of additional disk space will be used. "Unix/Linux Installation", "Installing Jenkins on Ubuntu"
Need to get 48.4 MB of archives. Selecting previously unselected package jenkins. Not creating home directory `/var/lib/jenkins'. See this done for other servers above. I also installed sendmail (see "Ancillary" below). I do not install the scp plug-in; it's useless. On my application server hosts, I set up a user, jenkins, that I'll use from Jenkins here to copy any WAR files I wish to deploy. I have to a) create a public key (here), b) copy that key to those "Jenkins" users and c) ssh once from this host to each of those application server hosts to ensure that, later, Jenkins can invoke scripts to perform the copy with sufficient access. Note below that the Jenkins installation seems to know already that I'm going to want to do this: it comes with a key already generated. I only need to copy that key to my application servers. drwxr-xr-x  2 jenkins nogroup 4096 Mar  9 16:14 .
drwxr-xr-x 11 jenkins adm     4096 May 10 18:14 .. The authenticity of host 'app-1 (192.168.0.29)' can't be established. ECDSA key fingerprint is e7:71:f2:f7:ba:c8:98:d7:78:88:e1:46:dc:69:f1:b1. Warning: Permanently added 'app-1,192.168.0.29' (ECDSA) to the list of known hosts. The authenticity of host 'app-2 (192.168.0.33)' can't be established. ECDSA key fingerprint is d6:44:9c:ed:01:74:7a:7e:ae:30:94:2f:8f:3e:99:62. Warning: Permanently added 'app-2,192.168.0.33' (ECDSA) to the list of known hosts. Finally, I verify that the key works. And now, when Jenkins successfully builds my server application, it will be able to deploy it by copying it over to both application servers. This is so Jenkins can notify in case of broken build. Here's the full scrape for whatever worth that is. Need to get 2,098 kB of archives. After this operation, 7,548 kB of additional disk space will be used. Selecting previously unselected package libdb4.8. Selecting previously unselected package procmail. Selecting previously unselected package sensible-mda. Selecting previously unselected package sendmail. update-alternatives: using /usr/lib/sm.bin/sendmail to provide /usr/sbin/sendmail-mta (sendmail-mta) in auto mode. update-alternatives: using /usr/lib/sm.bin/sendmail to provide /usr/sbin/sendmail-msp (sendmail-msp) in auto mode. update-alternatives: warning: not replacing /usr/share/man/man8/sendmail.8.gz with a link. WARNING: local host name (jenkins) is not qualified; see cf/README: WHO AM I? 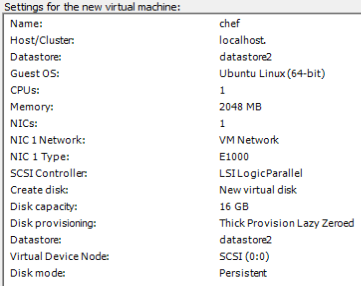 ESX details for a very small, modest VM I set up only for serving up Chef. Selecting previously unselected package chef-server. Thank you for installing Chef Server! Connection to chef closed by remote host. I made an RSA key, id_rsa.pub, which I copied to each and every VM, app-1.site, app-2.site, db-1.site, db-2.site, db-3.site and jenkins.site. Since I can't afford Big-IP and someone told me Apache can be rigged to do the job of directing traffic to my two Tomcat servers on app-1 and app-2, I look into setting that up. Here are some notes I'm putting together.